I became enamored with Moth's nails from her blog Through the Looking Glass, and wanted to try to find a good way to do it myself at home. Like most things, I suffered through some trials and errors, so I figured I'd share with you some tips about what worked and what didn't, so that you can create a similar look on yourself if you like! Leaving the half-moon shape at the base of the nails un-painted (or natural-looking) is also sometimes referred to as a reverse french manicure, and is often referenced as "Dita Von Teese nails," because she sports this look, only with red polish, as a signature style. 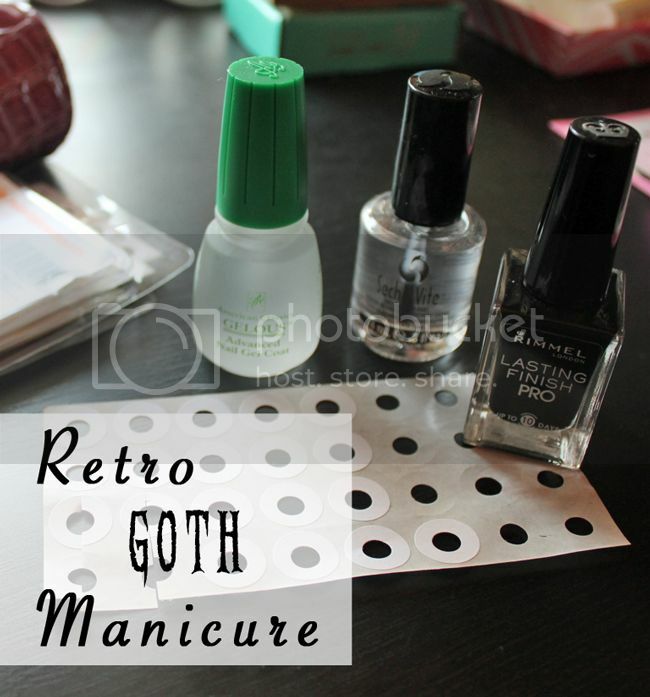 A fun fact that I learned was that the reason this look was so popular in the 30's-40's was because women could go longer between manicures without the outgrowth showing, thereby saving money. Score! 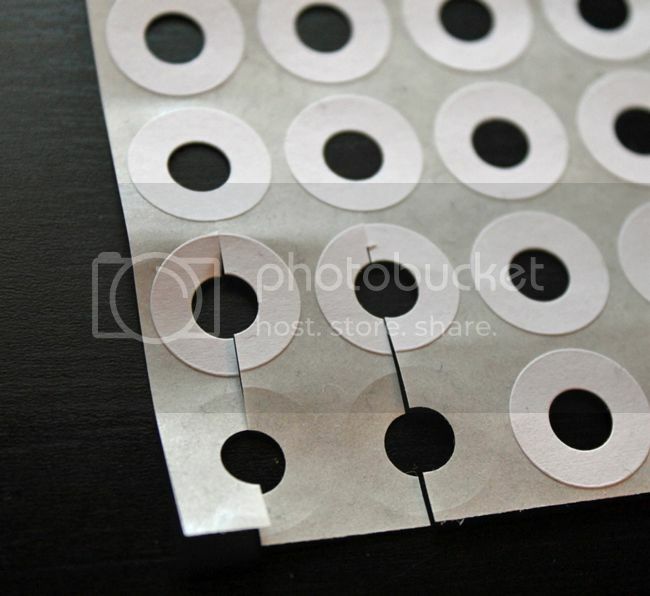 I'm sure it's no secret to most savvy blog readers that you can use adhesive hole reinforcers to get a nice masked-off curve on your nails. What I didn't realize was that cutting them in half is pretty dang important, because they'll lay better. I tried sticking them down the first time as whole circles and my masking was just pretty embarrassingly sloppy. So cut those suckers in half and get twice the mileage out of them as a bonus! A coat of Gelous polish to the bare nail. Let dry completely. 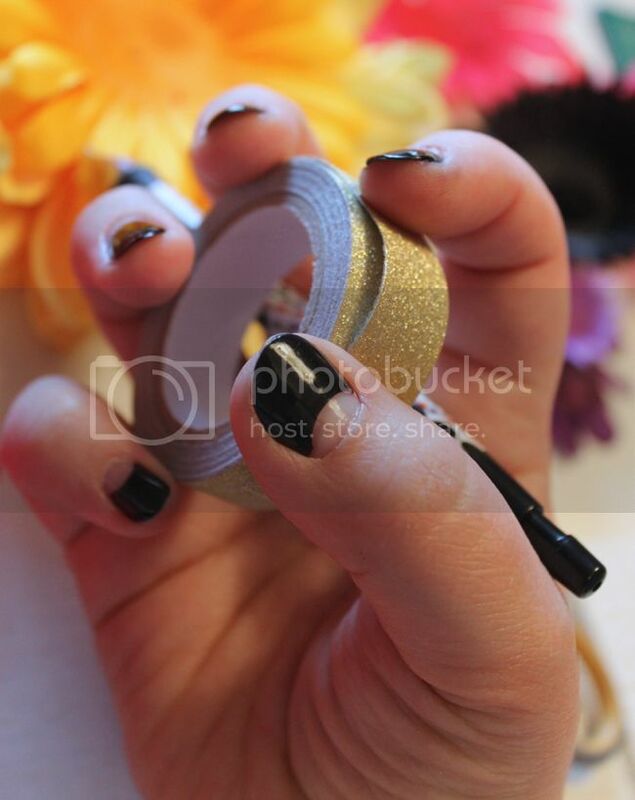 Firmly adhere paper reinforcer to your nail where you want to mask off the nail. 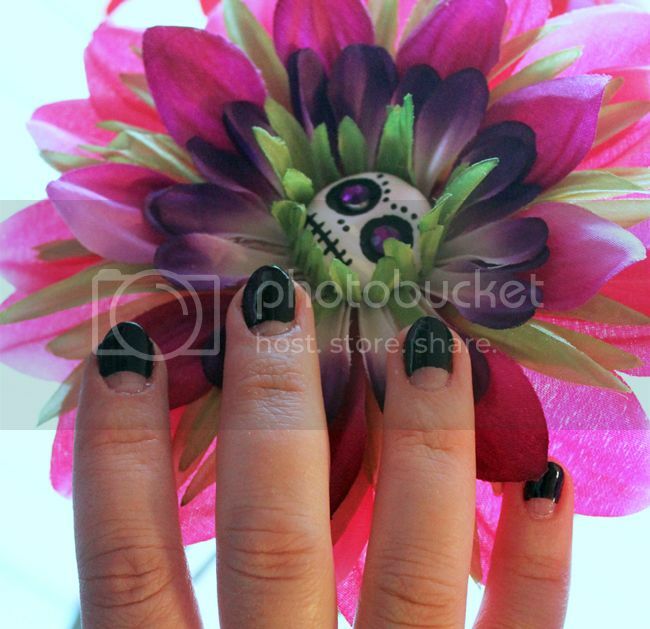 The amount masked off should be the same for all five nails (I made this mistake the first round). 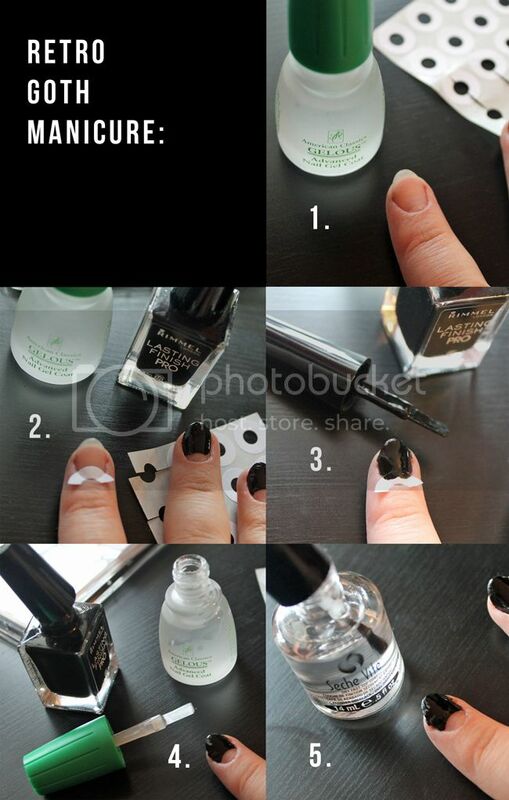 Paint nail with black polish, and remove sticker while polish is still wet. Let dry. Apply a second layer of Gelous. 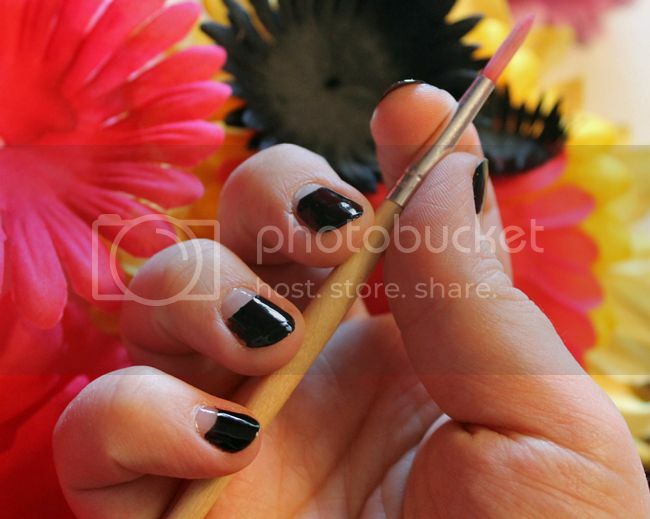 Let dry, then apply a second layer of black polish, getting as close to the edge as possible. Let dry. Apply Seche Vite top coat. Let dry, then apply one final layer of Gelous. Try not to mess them up while all those layers dry and solidify completely. I recommend an hour of Plants vs Zombies 2 on the iPad. That oughta do it. Even though the polish itself ends up not even making it a week on me, I love the look, and I've been extending it by just touching up the chips with black polish and another layer of Gelous here and there. I'm considering just getting fake nails in this style, only slightly longer and pointier to mimic Moth's nails, I love them so much.